This pretty travel bracelet is made of the semi-precious gemstone Jade which is believed to offer protection from negative energy and to give strength and inner peace. 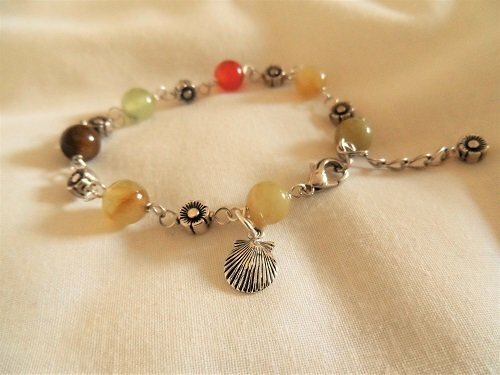 The little concha shell of Spain's Camino de Santiago attached to this bracelet, is also a symbol of protection on a journey. Every year, some 200,000 people travel "El Camino" - the so-called Way of St James in Spain, to find inspiration and to reflect on their lives in a supportive environment. Many carry with them a scallop shell symbol like this. The addition of the Jade gemstone makes this into a truly meaningful item of jewellery for travellers. This bracelet would make a beautiful present . . a gift with real meaning for someone setting out on a journey. Comes gift-wrapped, like all our presents - and we can print a personal message on your behalf. JADE: The multiple coloured gemstone of Eternity, Longevity, and Energy, and some say, love. Jade is believed to increase body strength, energy and longevity - being worshiped in times gone by for its life-extending powers. The perfect present for that special event requiring extra energy. More information about Jade . .